Here at Miramont Family Medicine, our goal is to make sure that every single patient that walks through our door gets the treatment they need. Whether you’re in need of x-rays, vaccinations, or a routine physical, we’ll make sure that when you choose us, you get the best possible healthcare in Fort Collins, Wellington, or Parker. As a matter of fact, we want you to be confident in scheduling an appointment with us. That’s why in today’s blog, we’ll take a look at a three of the main things you can expect from us when you visit the team here at Miramont Family Medicine. Keep reading to learn more about who we are and we can offer to each one of our patients! At Miramont Family Medicine, we take a lot of pride in what we do. As a matter of fact, it’s our goal to make sure that each and every person that walks through our door gets treated like family (it is our middle name after all). No matter what your reason for visiting is, you can rest assured that you’ll be treated with respect. We want you to know that we’ll take the time to listen to you in order to provide you with a diagnosis that’s accurate. When you visit the doctor, the last thing you want is to wait in the waiting room for too long, then sit in an empty room only to see the doctor for a few minutes before being rushed back out with no idea of what just happened. We’re not like that. We’ve taken care to hire an expert staff that won’t let you down. And speaking of our staff, let’s take a look at the three things that make Miramont Family Medicine so great. When you visit Miramont Family Medicine, the first thing you’re likely to notice is that our staff is friendly. Whether it’s the receptionists that greet you when you check in for your appointment or the nurses that start your appointment off on the right foot, we pride ourselves on hiring only the best, most qualified members for our staff. We want you to know that you’re cared for from the moment you walk in the door and when you visit us, that’s exactly how it will be. One thing that we always hear from our patients is how much they appreciate the doctors at Miramont Family Medicine. When you finally find a doctor that you click with, it’s one of the most comforting things in the world. When you visit a doctor at Miramont Family Medicine, you can rest assured that he or she will do what it takes to make sure that you’re taken care of in the best way possible. There’s nothing quite like finding a doctor who you can trust who takes the time to learn about your family history in order to provide you with expert care. From the nurses to the doctors to the rest of the staff at Miramont Family Medicine, we want you to know that we’re fully dedicated to ensuring that our patients get only the best treatment. No matter what it is that ails you (or if you’re simply in for a routine checkup), we’ll take great care of you. We strive to provide our patients with a level of care that’s unmatched in the industry in everything from calling to schedule an appointment to the appointment itself to speaking with our billing department. We’ll go above and beyond every step of the way. 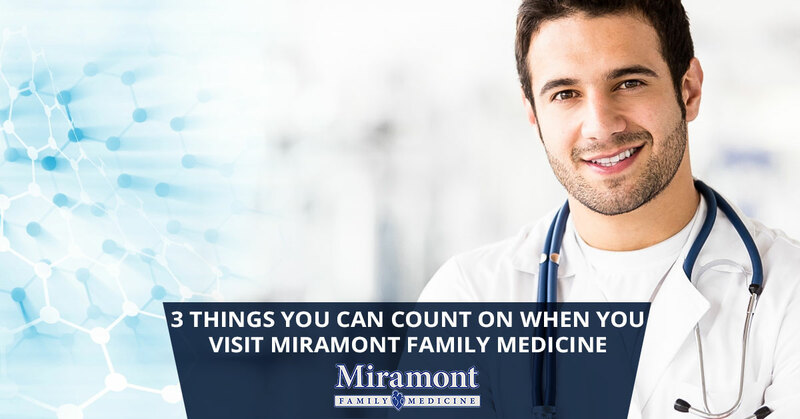 Schedule a Visit with Miramont Family Medicine Today! Now that you know you can count on our incredible team, why not schedule an appointment? Whether you simply haven’t been in for a checkup in a while or you’re dealing with allergies, we’re here to help. By providing our patients with expert care, we aim to be the best source for healthcare in Northern Colorado. Whether you visit us in Fort Collins, Parker, or Wellington, you can rest assured knowing that we’ll be there for you when you need us the most. Schedule an appointment with us today!